Rising star Gemma Arterton is the first to admit she has come a long way in such a short space of time. Before appearing in the recent box-office smash “Clash of the Titans” opposite Sam Worthington, she played a Bond girl in the latest 007 movie “Quantum of Solace.” Now, she stars in Walt Disney Pictures’ “Prince of Persia: The Sands of Time” where she plays Tamina, a high priestess who teams up with Prince Dastan (Jake Gyllenhaal) to save the mystical Dagger of Time which has the ability to turn back the clock. But with plenty of interested parties desperate to get their hands on it, the pair must battle against the odds to work out exactly who they can trust during this quest full of twists, turns and epic adventure. Gemma Arterton: My past roles didn’t really have any action. In this I have a lot of action. But Tamina is a High Priestess, so she is not your typical gun-wielding character. She's very spiritual so it’s an interesting take to have someone’s action set against her religious beliefs. Arterton: Tamina is the Princess of Alamut, a city that the Persians invade and I’m kind of kidnapped. She's very spiritual so she just dislikes them. Jake’s character and mine have this real love/hate relationship. Obviously they fancy each other but they don’t show it. They join forces and find out more information about the bad things that are happening in Persia and so they learn from each other. The film is a journey for them both. She is his right-hand girl. It’s not just an action/adventure, it’s not just a romance, it’s not just this or that, there is lots of drama and it takes you in different directions all the time. 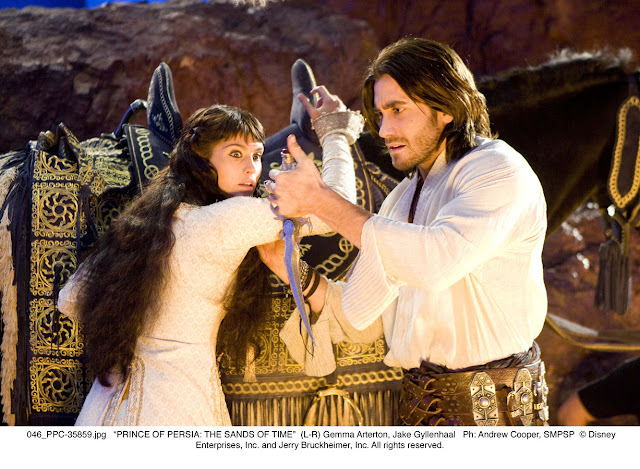 Q: What have you enjoyed most about filming “Prince of Persia”? Arterton: I love all the action stuff. I think I should have really been a stunt woman. I really enjoy it even if sometimes you think, 'Oh my god, there are people that are trained to do this and to get battered and bruised’. But I've loved doing the fighting. There isn’t a particular style to mine because it’s quite wild. She's never been trained to fight. It’s just me going 'Aaarrrggghhh'. Where I went to drama school, I trained in stage combat quite heavily so I had a bit of experience before. It is gobsmacking seeing the sets and the costumes and the sheer scale of this film. You are put into this completely different world and that is really, really fantastic because you don’t have to imagine much because it is there right in front of you. Arterton: I had to learn how to horse ride as I'd never done it before in my life and it’s kind of become a real new passion for me. Pretty much the whole cast went to Spain and learned to ride for two weeks, which was an incredible opportunity to have. Arterton: It is absolutely inspiring. I tend to go into things head first and not really think about what I am doing, which is sometimes better than going, 'Oh my god, I’m just about to act with Sir Ben Kingsley!' Then you are yourself and that’s what they want ultimately anyway. You're just another actor working with them on a film. It’s brilliant but I don’t think I get too worried about it. I probably should, when I’m being all cheeky and scampy with Sir Ben Kingsley, but no, it’s brilliant and an honor. Q: Your career has moved very fast in such a short time – how have you found that? Arterton: Since the Bond film came out, everything has happened very quickly, I'm really starting to feel it. Usually I can get on with my work and not think about it but it’s actually had an effect on my life now. Hey, why not? If it’s going to happen, it’s going to happen. It is mad what has happened in a year. In a year I think I’ve done eight films. I don’t know how I’ve done it.